Causeway Bay is renowned for its shopping, Happy Valley races and Times Square. For arts and culture, people are drawn to the quirky streets of Soho, or the coffee shop-laden hills of Sai Ying Pun. However, Causeway Bay has a secret side unknown to the shoppers swarming the neighbourhood. 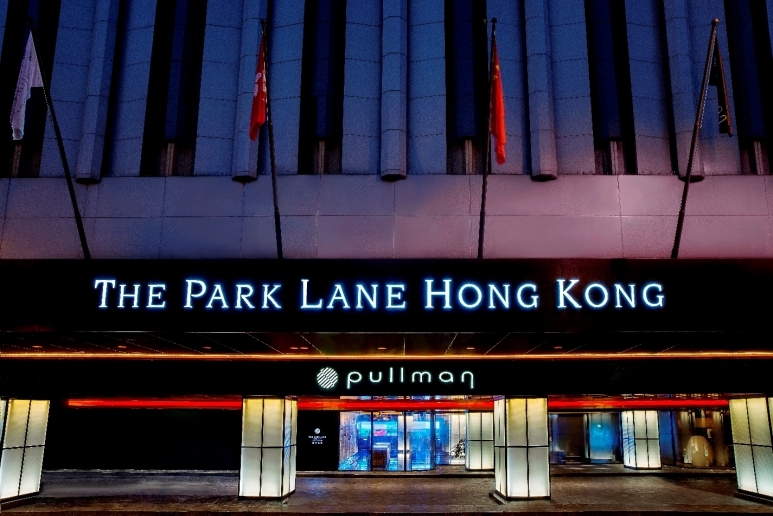 The Park Lane Hong Kong, rebranded in 2015 as a Pullman Hotel, has recently undergone a HK $300 million renovation. The makeover breathed new life into the staid business hotel, transforming it into a stylish hub for the modern traveller. The stunning unveiling of The Park Lane Hong Kong’s new look in late 2016 places it at the forefront of design hotels, with artistic flair imparted into every little detail. 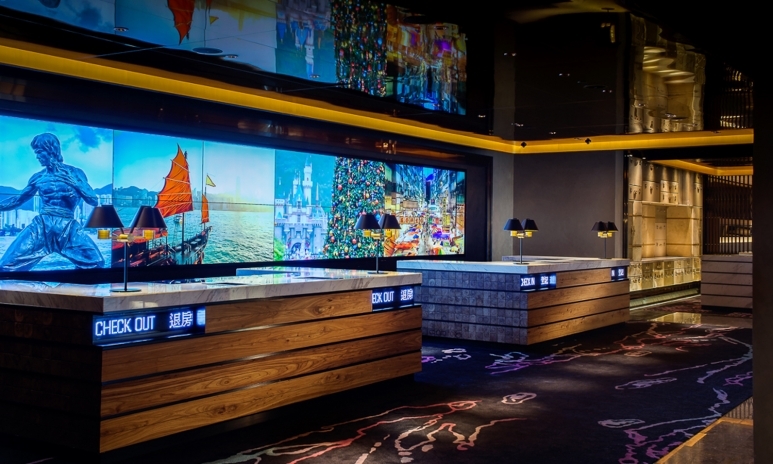 Hoping to attract young professionals from around the globe, the hotel’s focus on design is not just limited to the artistic variety: innovative technology is also a key improved feature. We check into The Park Lane Hong Kong for a staycation like no other. The hotel lobby is all your wanderlust realised. The travel theme designed by Hong Kong architects CL3 takes inspiration from vintage England, which materialised in the walls of suitcases and trunks behind traditionally-attired concierge staff. 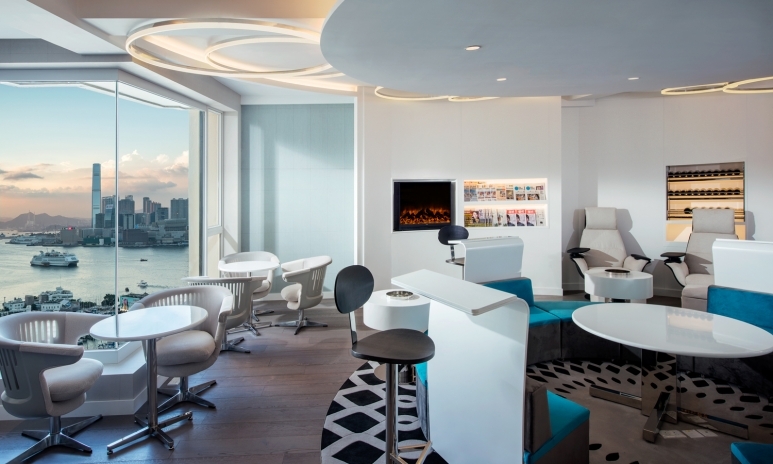 On the flip side, a sleek desk in front of a video display wall showcases panoramic views of Hong Kong, giving the impression of a slick, futuristic airport check-in. A separate check-in for executive guests gives an extra touch of luxury. Keep an eye out for a secret black trunk at the side: between 4am and 6am, it becomes a coffee station for early risers and high flyers. Practical, functional and utterly lavish, the lobby sets the tone for an engaging stay. 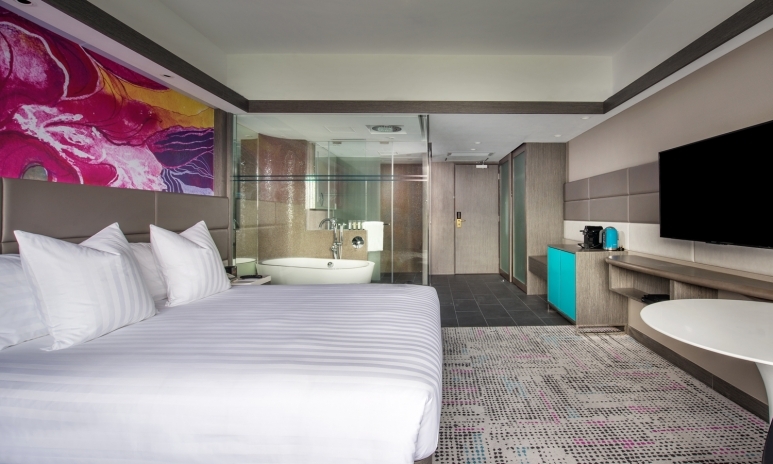 As stylish as the hotel lobby, the bedrooms cleverly uses glass to maximise space and light. The sleek grey, white and black finishing is broken up with a stunning artistic rendition of Hong Kong’s national flower, the bauhinia, in warming pinks and orange above the bed. The dark wood used in the room is sustainably sourced, and the use of LED lights mean you can feel good about your carbon footprint for the evening. The room is hardly style over substance, though — each executive room comes with international plugs, private wireless internet, bedside media hubs and a high-definition TV. Designed with the busy professional in mind and the technology-driven traveller of today, this room is comfort and convenience combined. Unpack so you can go explore. Head for lunch at PLAYT, the hotel’s buffet restaurant. Serving up breakfast, lunch, afternoon tea and dinner, the restaurant sits just beyond the hotel’s first-floor lobby in the mall arcade. 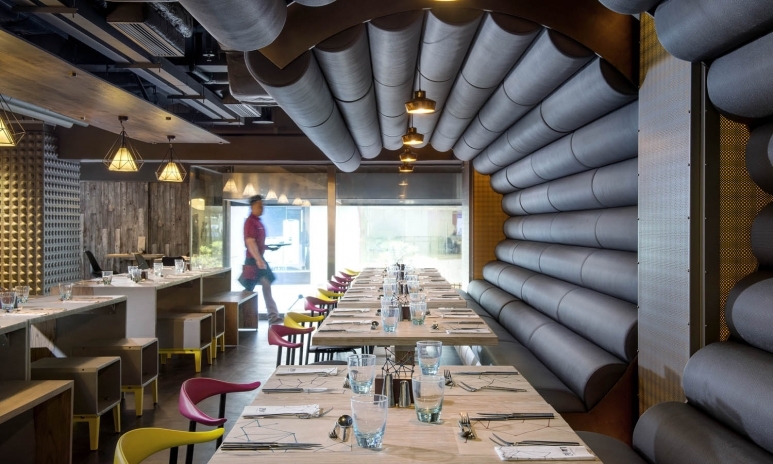 The design-focused restaurant features work by Hong Kong street artist Victoriano. His pop-culture inspired murals display iconic images like Johannes Vermeer's The Girl with the Pearl Earring and Marlon Brando in The Godfather, as well as a tribute to Banksy in which he features his own daughter. Offering international fare, it’s the seafood that really stands out. A stunningly fresh selection of lobster, crab, oysters, smoked fish and sashimi sushi is at your picking. The homemade gelato is also not to be missed, with exciting and unusual flavours such Moutai, black truffle and foie grass. Creative from paint to plate, this place is a requisite stop during your stay. You may fancy yourself some reading time on the roof after lunch. 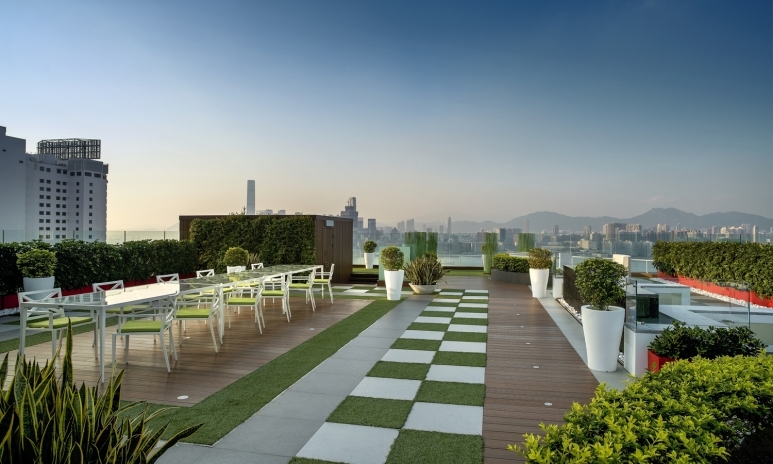 The hotel’s 26th, 27th and 28th floors feature five interconnecting function rooms and a small roof garden. While it is often used for wedding ceremonies because of its beautiful views and chic design, ask the concierge staff for its availability and get stuck into that book you've been meaning to read. It would be pretty hard to come to Causeway Bay within doing any shopping. But forget Times Square, skip the usual malls and seek out some quirkier boutiques instead. 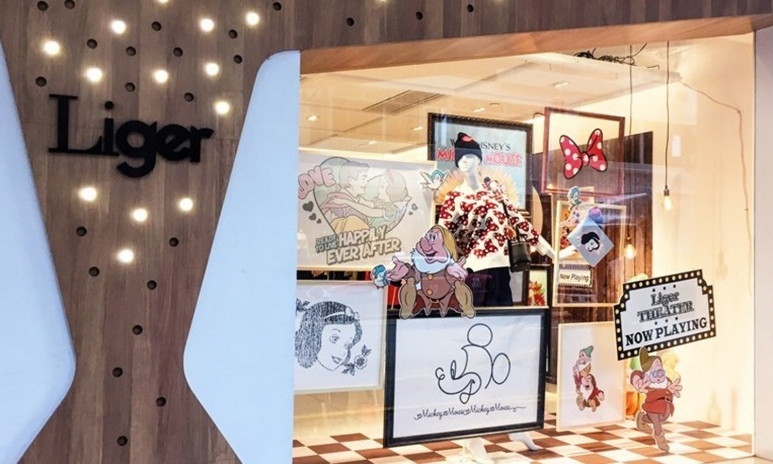 For the fashion conscious, Liger's flagship carries a curated selection of brands chosen by the owners to reflect their personal style for a unique shopping experience. For an unparalleled selection of vintage watches, visit Good Ol’ Days in the World Trade Centre — the tiny shop carries classics from the likes of Rolex and Cartier. And for any music buffs, Restrostone carries a variety of American-exported and vintage music merchandise, from clothing to vinyl. A staycation is all about having time for yourself and a chance to reset. 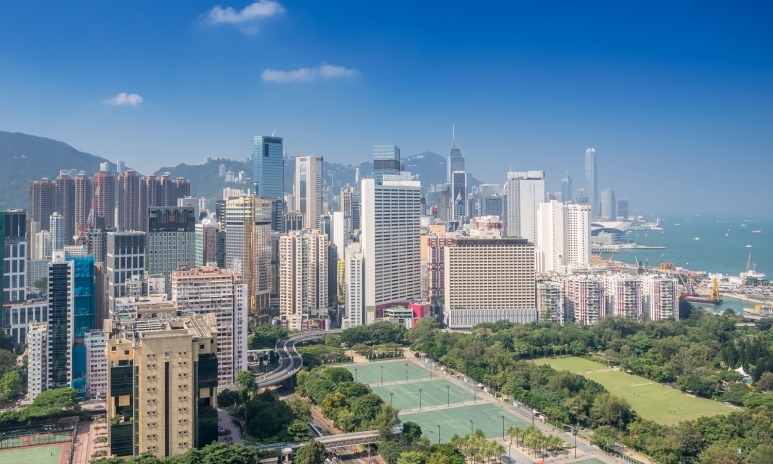 Unwind with some light exercise and explore Causeway Bay. Jog through the leafy Victoria Park, or take in some cultural sites along the waterfront past the Noon Day Gun and along to Golden Bauhinia Square. Alternatively, head into the hotel’s fitness suite and sweat out all the stress with the latest in fitness technology. Afterwards, you can relax in the sauna or steam room. 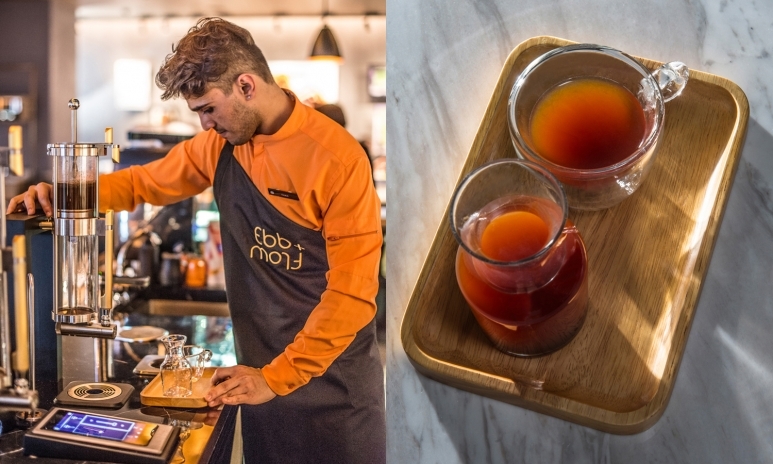 Enjoy an afternoon pick-me-up at Ebb and Flow. Situated in the hotel’s lobby, the chic café is perfect for chatting over afternoon tea or settling down to business. The hotel also uses the space to showcase its Artist Playground, an exhibition highlighting the work of a contemporary artist. Currently on display is Michael Kistler, an American artist based in Hong Kong. His work shows Hong Kong from the perspective of an inside-outsider, and the lively pictures are a great talking point over some unique steam-brewed cuppa. A tech-operated coffee machine uses steam to instead of traditional pressing methods for a smoother but lighter drink. The rich and velvety Ethiopian blend is the perfect pick-me-up for caffeine lovers. After a long day, it’s important to have some "me" time. Many of us in Hong Kong don’t have the luxury of a beautiful, free-standing bath – and certainly not one with a view. 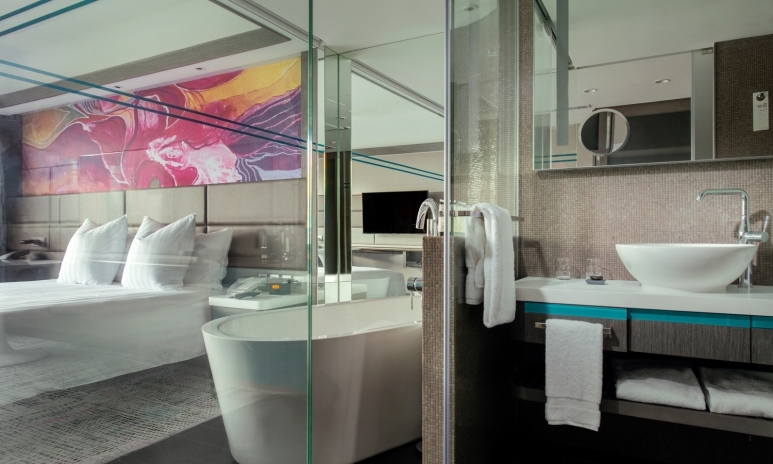 However, the clever design of the room ensures that you'll be lavished with natural light and a stunning view of the city skyline while soaking in the tub. So grab the latest copy of Hong Kong Tatler and try out those bath bombs you received as Christmas presents. Now that you’re feeling fresh and fabulous, head to the executive lounge. Exclusively for the use of executive guests, check-in is available here, refreshments are provided throughout the day, and breakfast is served from 7am-10.30am – but our favourite time is naturally the hors d'oeuvres and cocktail hour from 6pm-8pm. Serving up a variety of delicious bites, pre-dinner drinks are available while you relax in the sophisticated lounge with sunset views over Victoria harbour. ‘One cannot think well, love well, sleep well, if one has not dined well,’ said Virginia Woolf, and so if you’re going to truly relax on your staycation, a sumptuous dinner is required — and where better than the hotel’s very own restaurant, SKYE? With a more artistic flair on fine dining, the 27th-floor restaurant is comfortable but stylish with artwork by German street artist Kef and gorgeous design details in the cushions and crockery. With an impressive resume including work at award-winning restaurants in London and Dubai, head chef Lee Adams’ seven-course degustation menu is a culinary delight not be missed. 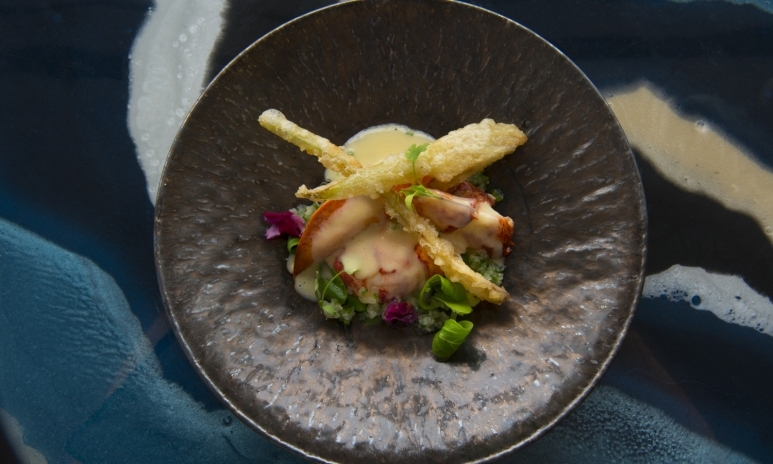 The contemporary French cuisine finds inspiration from Hong Kong’s eastern flavours: sublime miso scallops, butter-poached lobster with fennel tempura and Wagyu tenderloin with a chilli hollandaise sauce are just a few of the highlights. Take your time and enjoy the excellent wine pairings from the restaurant's international stock. If you’re staying at The Park Lane, you can’t miss the crème de la crème of its renovation – the SKYE bar. 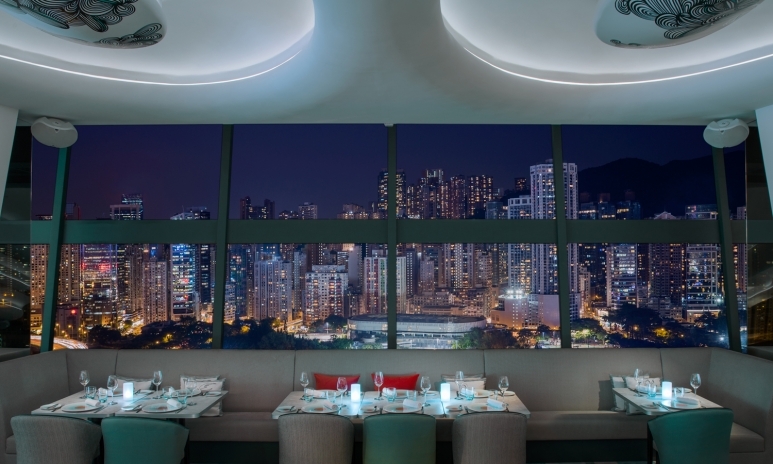 Adjacent to the restaurant, this is a lively hub of evening activity, frequented by international guests and Hong Kong’s trendsetters alike. The highlight here is the innovative cocktail list, created by Italian mixologist Valerio Politano. Taking inspiration from the artistic direction of the hotel’s redesign, Politano’s creative cocktails are art pieces in themselves, from unique glasses to the use of liquid nitrogen. 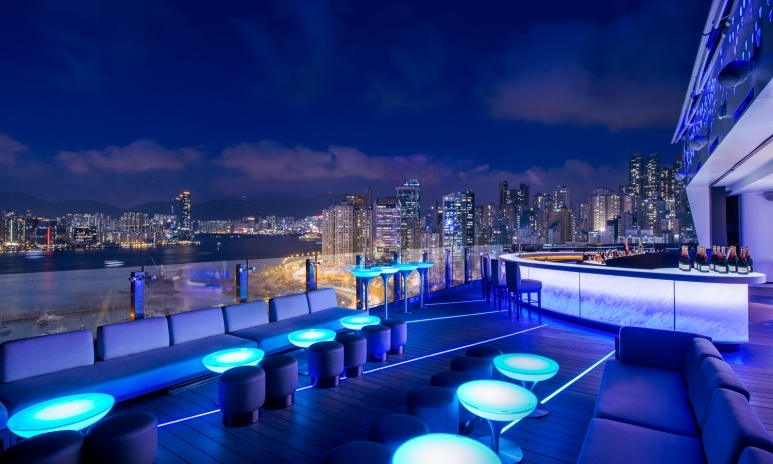 Sip your cocktail while enjoying the open-air views of Victoria Harbour – the temperature controlled deck, with glass windbreakers and patio heaters, provides an excellent inside-outside solution to Hong Kong’s temperamental weather.